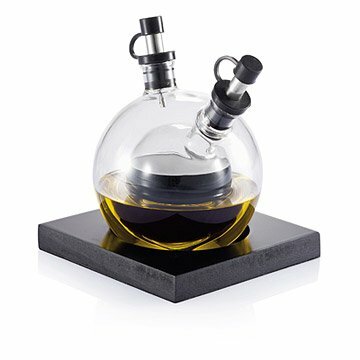 This cruet holds oil and vinegar in two mouth-blown glass bubbles, one inside the other. The visual magic of this double-layered cruet set is achieved with Old World technique—the glass is mouth blown to create a unique double bubble. The outer six-ounce layer holds olive oil, while the inner two-ounce layer contains the dark, contrasting core of your favorite vinegar, and both are sealed with durable, synthetic stoppers. The cruet's sleek black tray provides a space to display it. Handmade in China. Pair your Orbit Oil and Vinegar Set with our Planet Pepper and Salt Grinder. Very unique- this set is different than any oil and vinegar serving set I have seen before and I bought it for my daughter for Mother's Day. Love it! Very fun oil and vinegar container. Looks nice on the table and is fun to use! This product looks really neat, but one of the spouts cracked. I also found that there were white fingerprint looking stains on the velvet underneath the black stand. Tried to clean it off but I couldn't. I'm a bit embarassed to give it as gift for that reason and it's too late to exchange this since his birthday is coming up soon. Super upset and seems like they didn't handle this with care. This is a gift for my Dad, he is very intrigued by these so I wanted to get him a nice one. Many online from other retailers have reviews that say they break easily when you set them down so my hope is that by this one having a base made for it it won't do that. Again I have not tested this product as it's a gift. It is smaller than what I though based on the pictures but would still look nice on the counter. It's intended for oil and vinegar in one bottle. It's to be used as a conversation piece, filled with water of different colors. Fun gift for a foodie! My friend was delighted by this gift. He can't wait to use it. Now he just needs to find some more recipes that use balsamic vinegar. Darling gift. Bought many for Christmas and hostess gifts. Love this little cruet. I use all the time in kitchen.